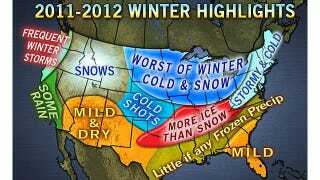 Accu-Weather released its winter weather forecast for 2011-2012 and it doesn't look good for those in the northern half of the US. Record cold temps and abundant snowfall are forecast for the region. Worst hit will be the Midwest and Great Lakes which are expected to have a harsher than normal winter. Chicago, which normally receives 39 inches of snow, is predicted to receive a hefty 52 inches. And that's not the worst of it. Forecasters predict this snow will be accompanied by extreme cold temperatures. You can blame this awful weather on the jet stream whose position will dump the snow and cold arctic air on this part of the US. While Chicago becomes the City of Brotherly Snow, New York City will fare much better this season. The Northeast region will avoid the blizzards it endured last year and, along with the Northwest, will have a typical winter season.